Skyscrapers didn’t dominate the skyline. Fast pass tickets hadn’t been invented and t-shirts with love hearts and appalling grammar were nowhere to be seen. Vietnam’s Hanoi was a bustling metropolis of colour and life, and, like the rest of the country, characterised by its people and culture, not glitzy façades. We whisked off for lunch before a trip that would eventually take us from Hò an in the North to Ho Chi Ming City. A wooden staircase creaked the way to a seemingly unremarkable room. Noodles laced with garlic, spring rolls that crunched and a watery peanut sauce that we’d combine with everything else on the table lay before us. 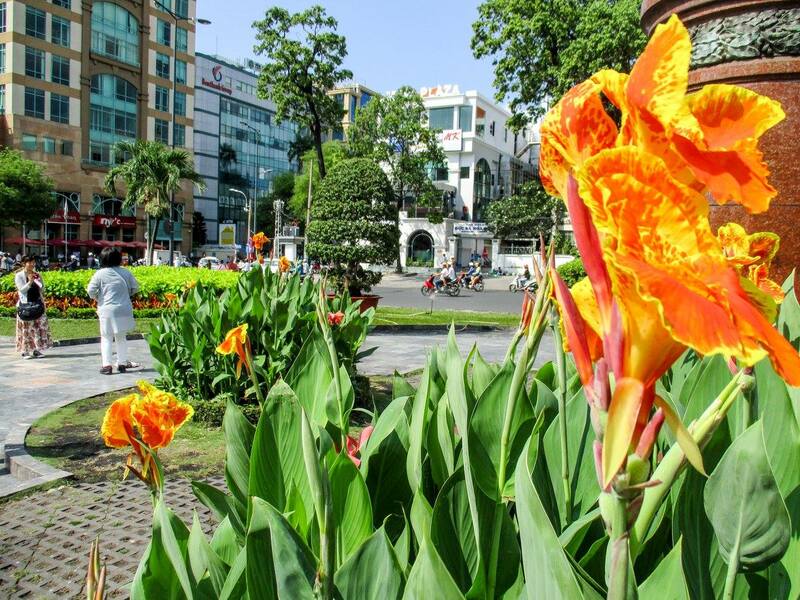 Hanoi surrounds the Lake of Hò an Kiêm, a tranquil basin that grounds the city’s hubbub. 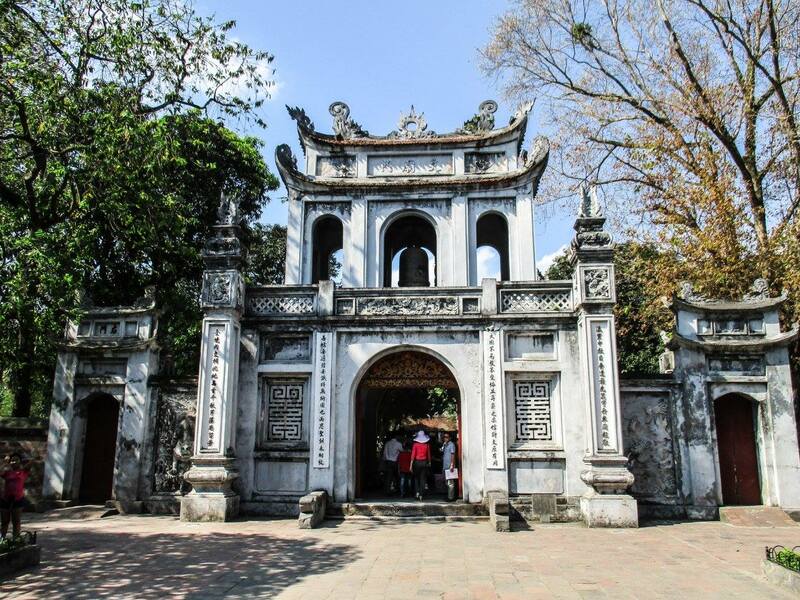 The Temple of Literature (University of Vietnam), with its oriental decoration, much inspired by the Chinese, and lavish embellishments, instantly contrasted with the western world. Streets danced a choreographed routine of eager taxi drivers, minivans ladened high with fruits and traders selling lunch, bracelets and washing machines off the foot square space above their bicycle’s back wheel. Hanoi was the starting point of our journey aboard the Reunification Express, so after a whistle-stop city tour we head to the station. On board we met Ly and Chao, a young Vietnamese / Chinese couple huddled together tucking into a local snack. Sold in banana leaves it had flavours of liquorice, cake, and something unidentifiable. We said hello, gratefully received a taste, and then proceeded to play language pictionary as silently conversed. 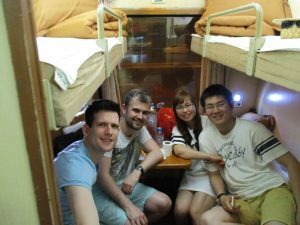 The Vietnamese sleeper trains are an experience. Far from high speed, the tracks choose their own path; alongside roads, over rivers, through villages and crops and cutting straight through cities and towns. ‘Go’ or ‘brake’ are the driver’s only two controls I believe, but the experience is endearing and decent sleep is achievable. 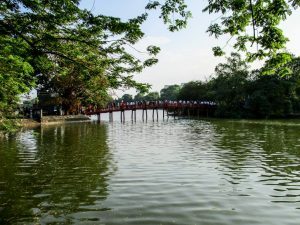 After a night in former royal capital Hue and a trip down the river in a Vung Tau (a traditional longboat), a short rail journey took us to Hôi an. Men and women wearing ‘non la’ (conical leaf hats) harvest paddy fields as we hurtled by, and shadowed mountains rolled beyond as Vietnam previously seen on postcards revealed itself. UNESCO-listed World Heritage site ‘My So’n’, is deservedly the main attraction here. A scattering of 4th century Hindu temples (Cham) sit still in lush jungle scored by gurgling streams and overlooked by Cat’s Tooth Mountain. 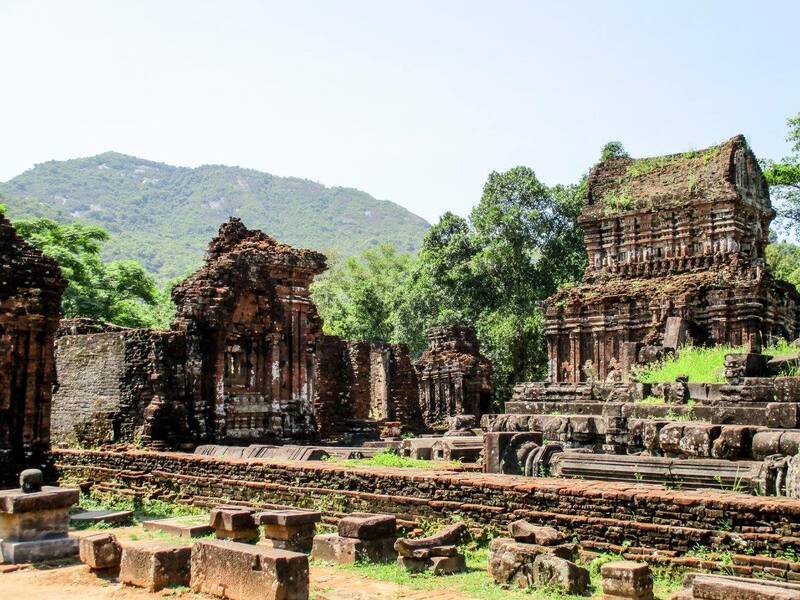 Just 20 of some 68 remain – a mixture of Vietnam’s erosive weather, and airstrikes during the war. 40 years on and the cracks and uneven surfaces now sprouted flowers and grass, as nature started to restore trust in its surroundings. “We can make the stone but not the glue”, explained our guide as he pointed towards a restoration project propped up by DIY scaffolding and bits of string. The temples were made from thin red bricks that sat flush against one another, believed to have been cemented using sap from a local tree – a tradition the 21st century had failed to replicate; some comfort I felt in protecting this majestic piece of history from millennial meddling. By 3pm it had reached 32 degrees. Now on our third day of our adventure in Vietnam it was time for a day of relaxation! We donned our caftans and pastel shorts, borrowed baby blue bikes from the hotel (basket included), and ‘toodled’ our way to the beach. Piña coladas topped off our time in Hôi an, as we sat besides the river watching old traditional boats bob, and the ‘Old Town’ transform from day to night. 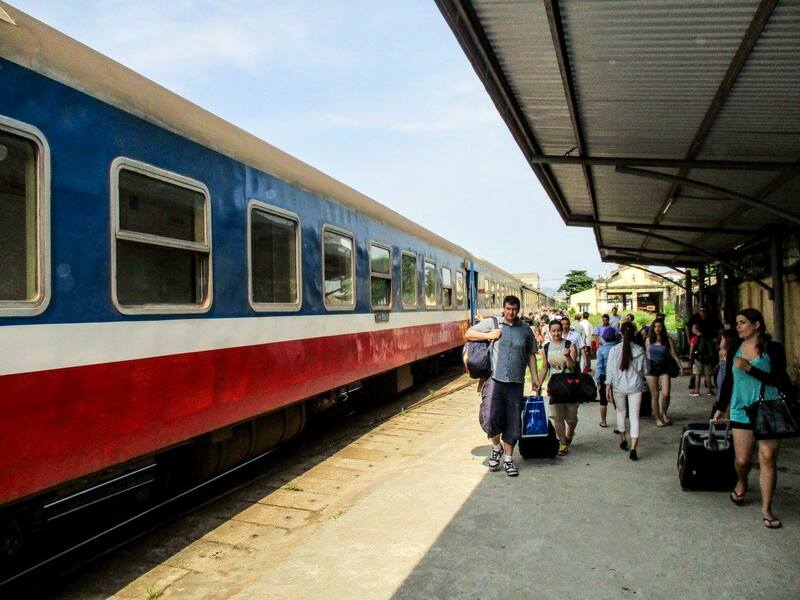 From Hôi an to Ho Chi Minh City it was another over night train. This southerly section of the route benefits from newly fitted carriages. The old shell of the blue and red 1970’s wagons were still authentically underdeveloped – but inside now enjoyed a pop up dining table, LED lights, and plug sockets! Freshly prepared sheets lay neatly folded and an embroidered blanket kept you warm, as the air conditioning took the edge of the humidity. Ho Chi Minh City was our last stop. Our guide Chien padded the concrete beams that fortified the walls of the Independence Palace. He didn’t seem comfortable. Earlier we’d visited the war museum. Brutal yet vital, it gives an insight into one of the world’s most poignant wars; Agent Orange, Napalm and no less than 7 million bombs pebble-dashed the land. At its peak more than half a million foreign troops were in the country fighting against the communist supports of the north. Now 40 years since the retraction of foreign troops the country still has a hidden divide. Our guide explained that in the north they call the city Ho Chi Minh, the post-warname created by the communist party, but in the south – it’s still Saigon. But, this is a country with momentous beauty and potential. Lived in by people who are scarred by the past, they love their home and each other, and look to the future. Chien smiled – he could see that on this occasion, nothing was lost in translation. Tickets can be a bit of a pain – there is no real online booking solution available. A company called Vietnam Impressive are nicely geared up for western customers. They can purchase your tickets ahead of your travel, as well as offering a number of other services. Alternatively use an packaged holiday rail specialists based in the UK. As with all train related queries I would highly recommend visiting Seat61 to see what Mark Smith has to say about booking – as the true train Guru of the world.